WOW these are amazing! What wonderful inspiration ... thanks! Your cards are absolutely amazing. Loving the designs and stunning colors! Love the color combo on the dragonflies! 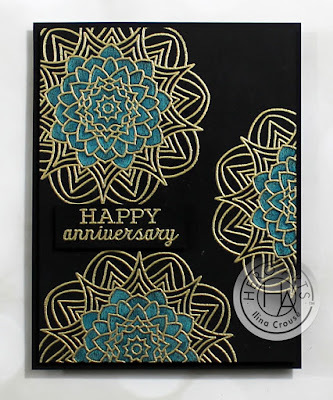 That last card, using the Kaleidoscope flower stamp, is perfect! The gold, black, and turquoise look amazing together and create such a bold look! Beautiful cards. 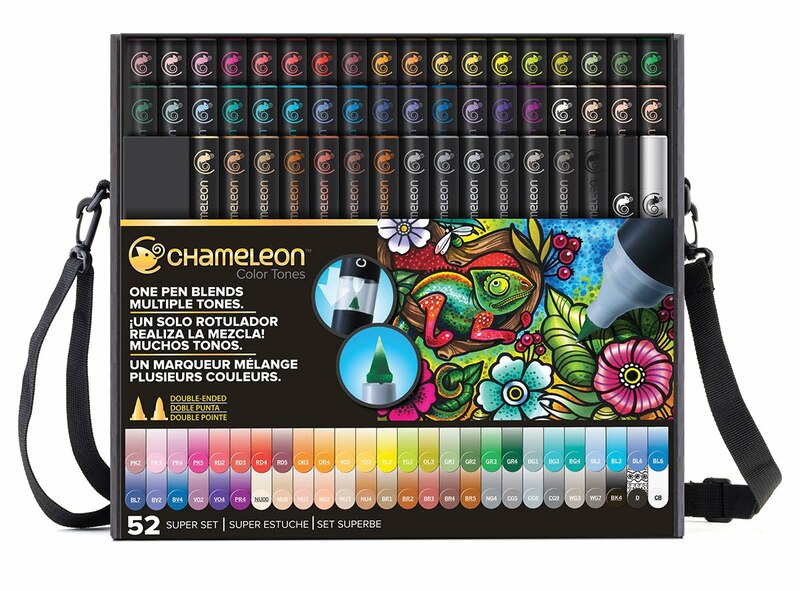 I love the dragonfly and butterfuly but that kaleidoscope in teal and black just caught my eye. I love it! TFS! Dear ilina all cards are very beautiful but I liked the dragonfly and butterfly . The other two cards kaleidoscope with black and teal was a rare combination. The Baloons card is plain but elegant. Thank u for the live you give into making these projects which are wow. Tc stay blessed. Love and hugs from Sri Lanka. Love your cards especially the dragon fly. 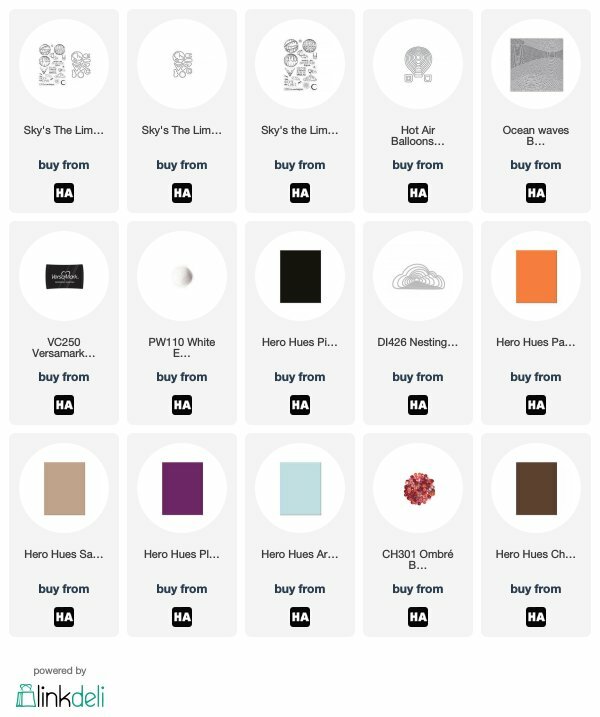 The new catalog looks like a good one. Juicy "moss" color there. lovely. Nice background work, too. Wow! Four cards. I would have to say the purple butterfly is my favorite! Thank you for the opportunity! Dragonfly is gorgeous as are all of the cards! Great inspiration! Just lovely!! I love the new dragonfly....your cards turned out so pretty. Makes me yearn for spring. Thanks so much for sharing today..
Beautiful cards! I love all the different styles and designs. Lovely cards--I especially love your card with the embossed monarch butterfly! Wow amazing cards! 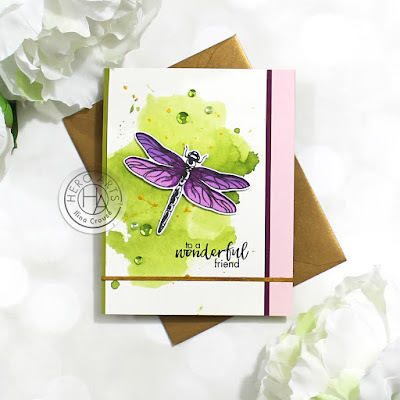 Love the color contrast on your dragonfly card! Beautiful cards! I love the dragonfly card with the purple and green. wonderful cards! I love the hot air balloons!! Such amazingly beautiful cards! You went ALL OUT for the hop!!! The purple and limey green look AMAZING together!! All your cards are gorgeous. I can't wait to get these fun supplies. WOW!! Gorgeous cards..Love the first one so much..
All of your cards are beautiful, but my very favorites are those sweet balloons! I can't get over how cute they are! Love the colors too! I love your card designs! Wonderfully creative and so very beautiful. great job with the ink! love the look! Great Cards - The dragon fly was beautiful! Those colors are stunning together! Love your kaleidoscope flower card. Great look and it's different. Wow.. these are amazing. As each design popped up as I scrolled I fell more in love. And then the grand finale. Gorgeous. All are GORGEOUS! But I love the dragonfly and that background! All four of your cards are beautiful! Thanks for sharing all the different design ideas! How cool is that kaleidoscope flower on black?!! Gotta have it!! 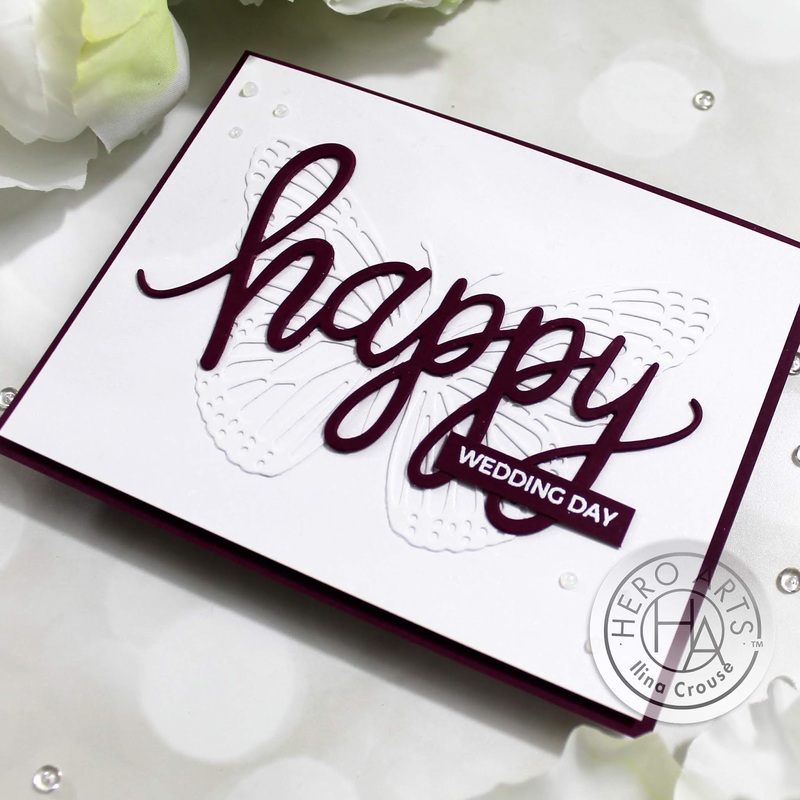 And I'm loving the elegant look that Monarch Butterfly adds to you wedding card!! All of your cards are beautiful but that purple dragonfly against the green color wash is my favorite, wow! The birthday card to so beautiful. Pretty!! Loving your watercolour smooshed background!! Beautiful cards! I especially loved the first two. That color combo was stunning. I like your purple dragonfly and the vibrant coloring behind it! I love the dragonfly colored and that kaleidoscope flower is so pretty! What great cards! Love the wedding one. Fantastic cards! Love the colors on the dragonfly card. The purple and green with the touches of gold metallic are so pretty. 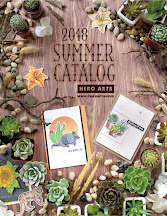 This is a great new release for Hero Arts! 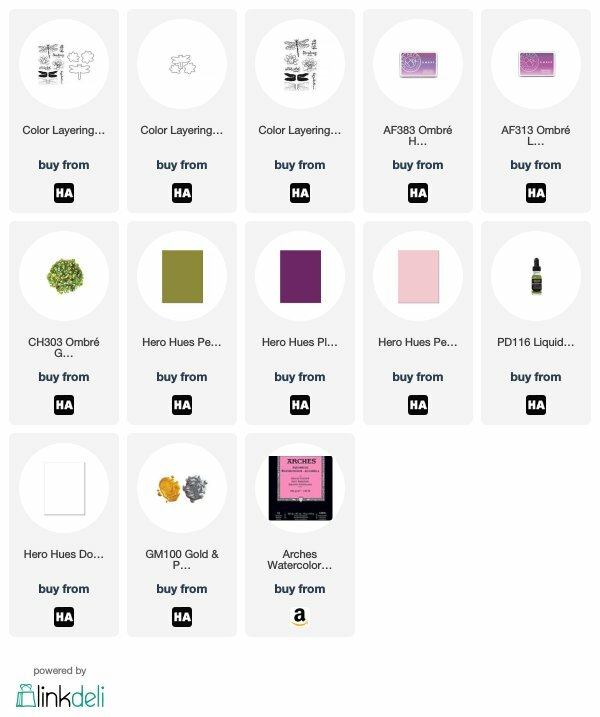 I am so amazed that you do so many samples for the blog hop. Great ideas. Love the new card stock colors! All your cards are lovely Ilina, thanks for the inspiration! Beautiful work! Love the dragonfly! Wow! 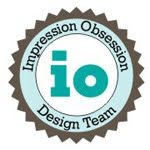 Fun new products and lovely inspiration. Great new products! 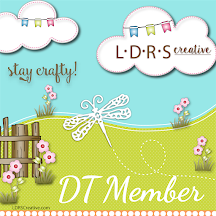 I love your creations, especially the gorgeous dragon fly card and also the Kaliedoscope! Beautiful coloring of your dragonfly! The big "Happy" is great! All 4 cards are beautiful! The Dragonfly card is simply stunning. I love the color combination you used and the watercolor smoosh background is perfect. Thank you for sharing all 4 cards and for the awesome inspiration with these new items! They are all amazing! I am in love with the Big Die-cuts. 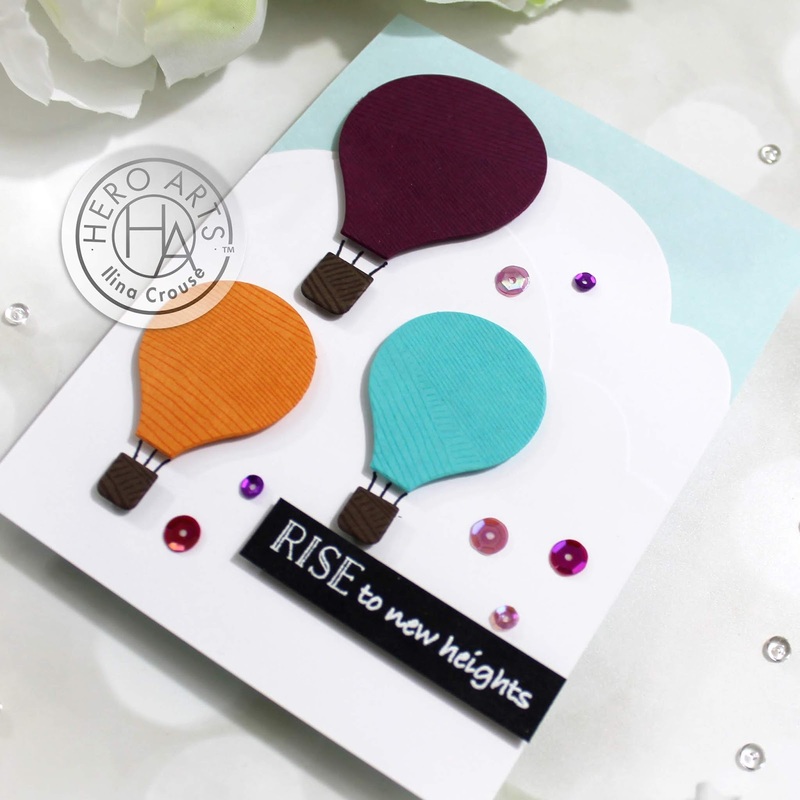 Ilina, your cards are wonderful and showcase the new products perfectly! Love your clean designs! Thanks so much for sharing and your wonderful inspiration! Love the dragon fly card! Clean and simple. Wonderful color combo on dragon fly card. Well done. Clean and simple. Wonderful color combo on dragon fly card. Well done. My comment got posted as "Unknown" above. Not sure why. Hope this one works. Love your use of color. The dragon fly card is really fun - like the two stripes intersecting each other and your blue on black for the other card is stunning. Your cards are beautiful and unique. I think I'm going to need the cloud and hot air balloon dies. Stunning cards Ilina, especially the one with the Kaleidoscope Flower Cling Stamp. When the catalog came out I had seen this one and fell in love with the stamp. Great to see how you can use it. Love all four cards - and I can't even pick a favorite! Gorgeous! Wow! I would have a hard time picking which card I love most! 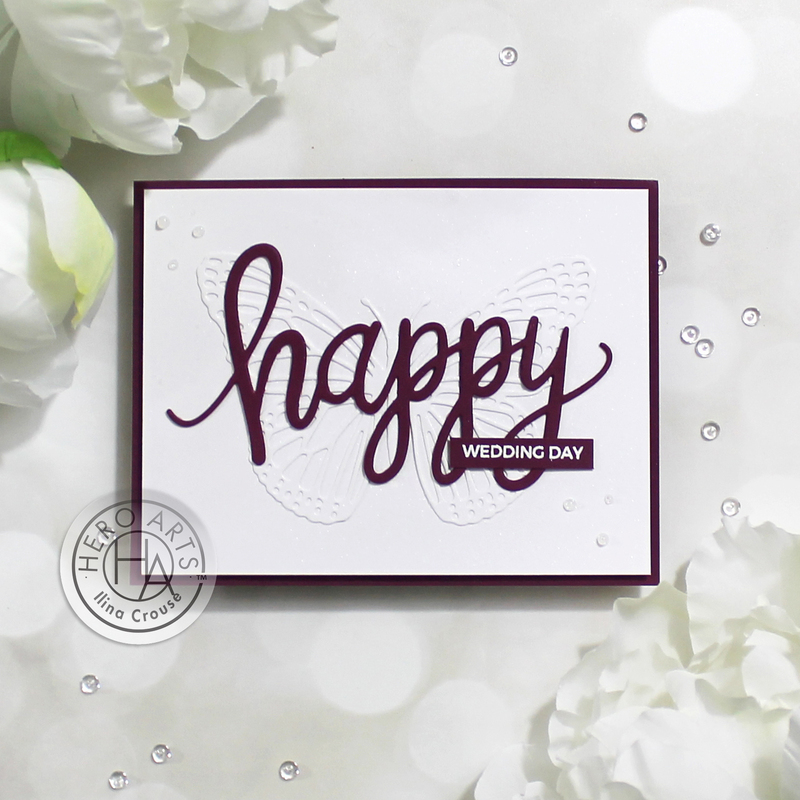 The dragonfly is gorgeous, but I really love the simple elegance of the butterfly wedding card. The other cards are great too! Awesome cards and love all the backgrounds! Beautiful cards, love the dragonfly. Great techniques and variety! 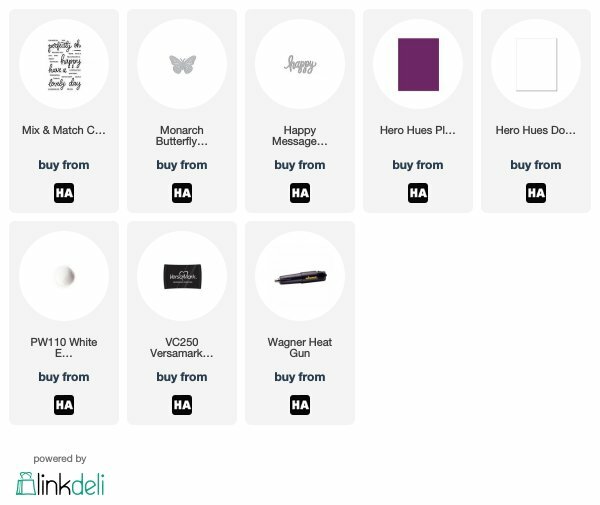 I also love the dragonfly sample. The colors and background are wonderful. OMG!! Love every one of them!! Some unique color combinations, and love the last one with that gold on the black card stock!! Wow the purple and green just pop together and the black card is beautiful. Got lots of inspiration from your wedding cards. Love all your cards! Beautiful cards. 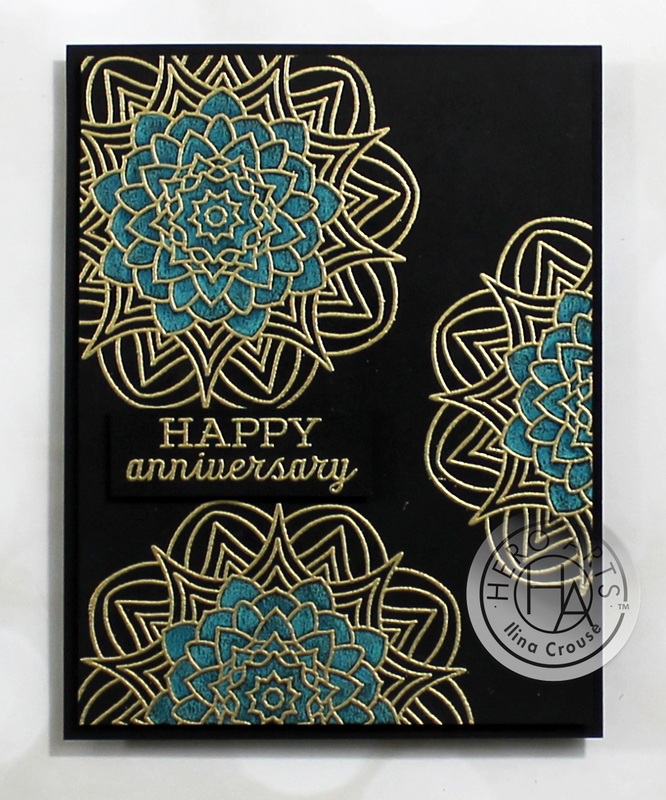 I love the Kaleidoscope flower card - so elegant and versatile! Lovely cards. The dragonfly is my favorite. Your cards are awesome! I just love the dragonfly, and the watercolor background is perfect! All these cards are terrific! 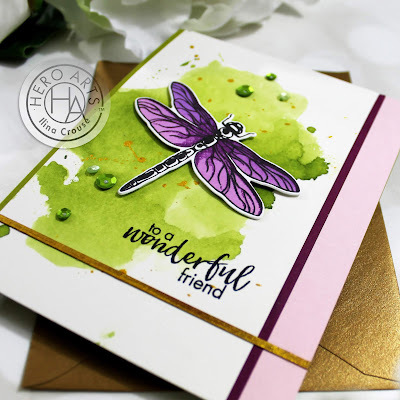 I, too, like the watercolor background on the dragonfly card...The happy die and rise to new heights card are both great, too! The kaleidoscope flower would definitely be a favorite of mine! I just bought the Fancy Die Dragonfly. But now that I see the dragonfly layering set put to use, I'm gonna have to get that one, too!! Love it. 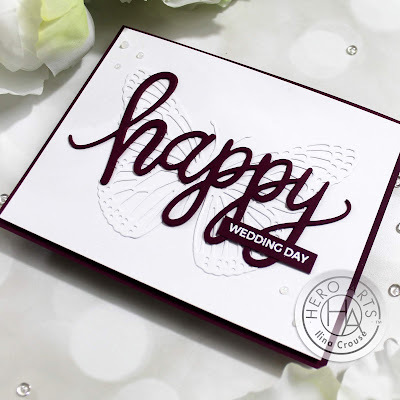 I love the wedding card - so sim[ple but so elegant! I also had to add the dragonfly to my order - thank you for your beautiful works! Your first card in the line up is special. Perhaps those colors? It's sure pretty. I think this release is really fun! The kaleidoscope flower card is outstanding. I love the dragonfly and balloon card as well. Really nice cards and design. Terrific cards. Lots of great ideas and inspiration! I love butterflies and dragonflies and thought your cards were great then i saw the kaleidoscope card and was wowed! Charming card, the first one featuring the purple dragonfly with green background is stunning! Wow! All your cards are totally amazing!!! I enjoy seeing the inspiration for the new products. But it makes it really hard to decide what to buy! Thanks for sharing. Your cards are beautiful, and I especially like the butterfly and dragonfly ones. It is hard to pick a favorite. All of your cards are great but the dragonfly card is probably the best. Love your cards. They're beautiful! I love the color combo on the dragonfly card. There something I found striking in each card. Wonderful cards! Love the dragonfly card. 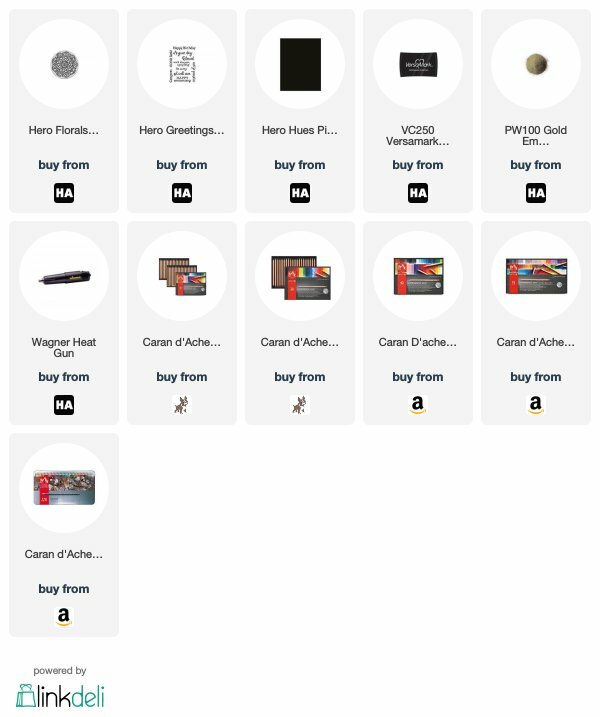 I've looked thru the catalog & noticed the products you used on the 1st 3 cards. 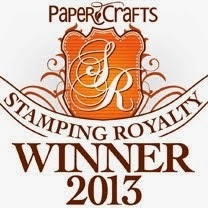 But now I want the stamp you used on the last card too because that's so pretty! Delightful cards. Love the dragonfly on the watercolor background. Wow! Four very lovely cards! Lve that dragonfly. Fabulous cards! The dragonfly card is so pretty, but I also really like the CAS styling of the butterfly card. Awesome cards! Love that gorgeous butterfly! Hot air balloons! The card is so simple and clean! The kaleidoscope card is amazing; what a beauty; a real-eyecatcher !! Beautiful cards! I love the colors you combine together! The kaleidoscope anniversary card is lovely! Your cards are amazing. Especially the kaleidoscope card. That one is stunning!!! Wonderful cards. Love the dragonfly. Hot air balloons are always fun. You've shared a fab range of cards with these fab new products. Love the dragonfly. All of your cards are gorgeous! I especially love the dragonfly - I love the colors! Wow, gorgeous cards! I love the white on white butterfly - so elegant! Beautiful cards. I love the Kaleidoscope Flower -- that's definitely on my wish list. Beautiful cards. I love the pretty dragonfly against the smooshed background. I also really love the Kaleidoscope card, the colors are so pretty. I love that kaleidoscope card! Wow!! Love that dragonfly card the best!! I love your CAS designs, and the colors you chose are perfect! Beautiful! 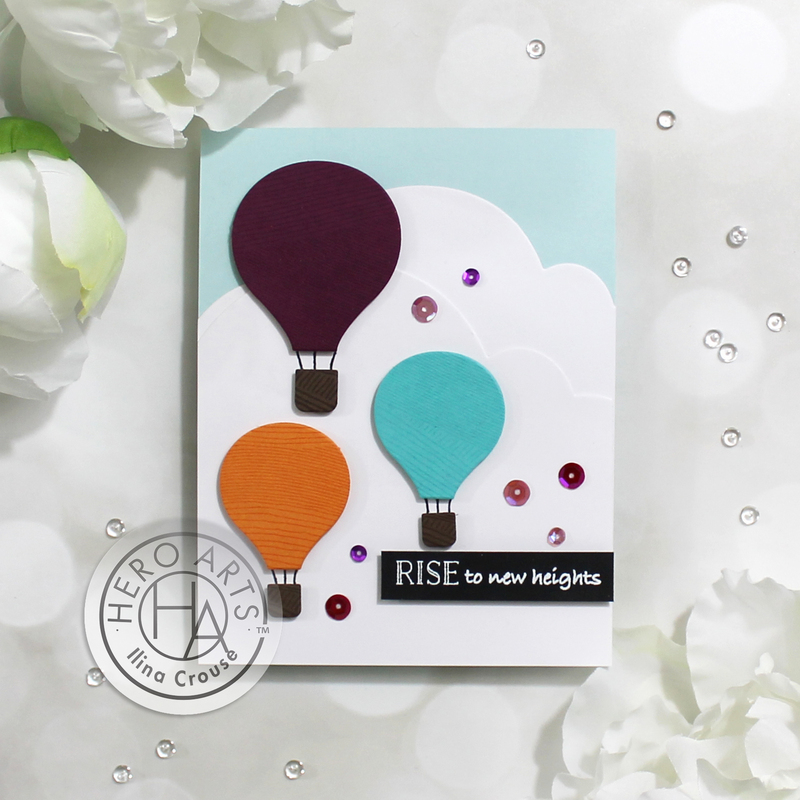 I just love the hot air balloon card. So cute. I love all of them, but especially the last one. The embossing on black is just stunning. What a beautiful card! That kaleidoscope card is gorgeous! Wonderful cards. I really like the purple dragonfly against the green background. Gorgeous cards, yet clean & simple! All your cards are great but my fav is the Kaleidoscope flower!!! That will be a must-have for me!